As most of you know, my year has been filled with health challenges. Each and every one of these challenges has been an opportunity in disguise for me to learn more about myself, my disability and has tested my patience in unimaginable ways. Ten days after the London Paralympic Games, I went in for a routine lumbar spinal fusion surgery and came out a quadriplegic. It took doctors all over the country close to 10 months to accurately diagnose and suggest a solution. I then went in for another major spinal cord surgery the end of May. I am happy to report that I regained function of my arms and hand almost immediately after the surgery. I am still dealing with recovery though. The challenging part about neurosurgery is, it's not quite the same (I'm learning this...) as orthopedic surgery where there is a prescribed plan or approach to rehabilitation of PT and increasing physical activity to improve mobility and to get better. With neurosurgery, you are restricted to how fast your nerves want to heal. As a Type A person, this is frustrating. There are good days, and there are bad days. I am slowly getting more involved and more active again, but still dealing with the physical aspects of nerve pain, tightness and the psychological aspects of wondering what this means for my athletic career. I am trying to remain optimistic and positive, however. I am doing a better job at listening to my body, asking questions to my doctors before things get out of hand, and relying on friends for support. Here's the way I see it: Things happen for a reason. This has been, without a doubt, a true test of my patience. I question so many things that I previously took for granted. Will I be able to get dressed today? Will I be able to make that transfer? Will I be able to do a 5K? Why is my body failing me at age 29? Before all of this, there really was no doubt in my mind that I would try once again to make Team USA for the Rio 2016 Paralympic Games. Now, I am not looking that far ahead. I am focusing on making each and every day in the present count. I am focusing on small victories. I am putting my trust in the universe that things will work out exactly the way they are supposed to. While I am still goal-oriented, and I believe it is important to have high standards for yourself, you also have to balance that with making goals that are manageable, realistic and adjust accordingly. If you raise the bar too high to the point of being discouraged on a daily basis, this is counterproductive and does more damage than good. So, take that lofty goal, write it down, and tuck it away in a safe place to revisit when the time is right. That's my plan. In the meantime, I'm focusing on regaining a basic level of fitness and continuing to find ways to bring happiness and joy to my every day life. The following is a letter to the editor from Dr. Cheri Blauwet -- a clinical fellow at Spaulding Rehabilitation Hospital, two-time winner of the Boston Marathon's wheelchair division, seven-time Paralympic medalist and member of the International Paralympic Committee Medical Commission -- and Dr. Anjali Forber-Pratt, two-time Paralympic Medalist, member, US Paralympic track and field team and Paul G. Hearne Leadership Award Recipient from the American Association of Persons with Disabilities, in response to a blog post from last Friday titled, "Boston schools ready for federal mandate to include disabled athletes." 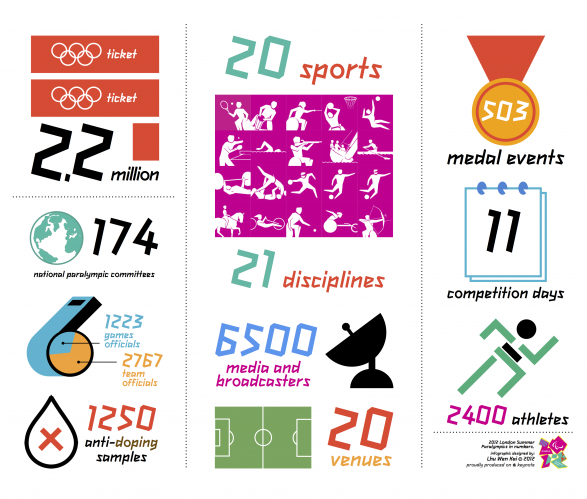 If you are wondering how the Paralympic Games compares to the Olympic Games, check out this one too! With that, I am 1 of 58 members of the US Paralympic Track & Field Team. 1 of 19 women. 1 of 227 U.S. athletes across all the Paralympic sports. I am a proud member of Team USA. There are 15 countries making their Paralympic Games debut. 2004 she won 55 medals, of which 41 are gold. deaf were already in existence in 1888 in Berlin. Imagine, being held at gunpoint as you try to catch the bus home. The weird thing about this moment is, I didn’t understand it at the time and yet it is something that I so vividly remember even today. I remember being surrounded by the entire gang, just past the front office, in a place slightly inconspicuous so the teachers and people of authority couldn’t see what was happening. The timing of it was just right, the very moment that I had rolled through that set of fire doors as they closed behind me...Read the rest here.